Heat the oil in a large saucepan, cook the bacon gently for 2-3 minutes then remove from pan Add the meat, ½ at a time, brown well. Remove from pan as each batch is done. Add the onion and carrot, cook for 2 minutes, pour fat from pan and replace meat. Sprinkle in the flour and stir over medium heat for 5 minutes. Return bacon to pan, add wine, tomato paste, herbs and seasoning, stir until boiling. Cover and cook over low heat for 1 ¼ hours or until the meat is nearly tender. In the mean time, gently fry the mushrooms in a little butter until softened. Strain liquid from the meat into a saucepan. Transfer meat mixture into an ovenproof pie dish and fold in the mushrooms. Thicken the strained liquid with a little flour blended with water, bring to the boil and pour about 1/3 of the mixture over the meat, reserve the rest. 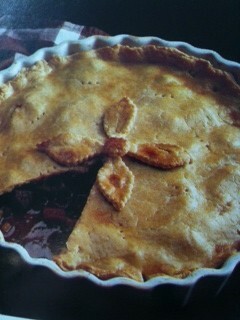 Moisten the edge of the Pie dish and cover with the pastry, crimp the edge, make 2 or 3 slits in the top of the pastry. Brush with beaten egg and bake in the oven for 25-35 minutes or until golden brown. Heat the thickened liquid in a pan and serve separately.